We went by the Golden Temple Mail to Jallandhar. This is a very punctual train, and one of the oldest trains of India as far as the service goes. Earlier, it was known as the Frontier Mail. Interestingly, the search term "Frontier Mail photos" led me to this blog, where you can see that this train started in the '30's of the last century. It used to go from Ballard Pier to Peshawar. Air-conditioning was provided by adding ice to specially made boxes installed in the ceiling of the cars. The boxes would be accessed by the worker who went up the roof of the train when it halted at the station, and he would open the box and fill in the ice! Our train began from Mumbai-Central station at 25 minutes past 9:00 p.m. on the 31st of May. It would take us all the way to Jallandhar, where we would get off; the train would continue on to Amritsar, where it would end. Our part of the journey would see the calendar changing dates twice, and we were scheduled to reach our station on the dawn of 2nd June.We carried a lot of food with us, including mutton and egg cakes, chapati, dry cooked potatoes, and specially made pattice and chicken rolls. These would last us till dinner time on the next day. We had to order just one non-vegetarian plate and one dal fry for the dinner. Although we were booked in AC 3-Tier, we enjoyed the "6-seater" box to ourselves throughout the journey as the remaining two passengers slept with some of their other relatives in another compartment. This was an unexpected blessing. as we got more space and more privacy. Thinking of this as a harbinger of better things to come, we kept up our spirits. Unfortunately, by the first morning, Nishrin was down with her famous migraine headache, and this continued to worsen through the day, leading her to shun all food and drinks and remain sleeping throughout the journey. Gamely, however, the three of us, viz. my two daughters and I, carried on with the usual stuff that railway passengers indulge in, such as playing word or card games, reading books, eating snacks, etc. When the day ended, we went to sleep by 11:00 p.m., setting our mobile phone alarms to go off by 3:00 a.m. later in the night. Eventually, although we all got up and readied ourselves by 4:00 a.m., the train got delayed and reached Jallandhar almost 75 minutes late, at 5:30 a.m. on the 2nd June, 2011. The train journey had come to an end. The troubles, however, had not yet begun, as we would discover shortly. Yes, they do, and they do not forewarn us when they do. My brother's daughter and my own elder daughter stumbled while negotiating a rough road patch last Sunday while riding a scooter. My daughter was driving, and had a helmet on; my niece was the pillion rider, and she did not wear a helmet because we didn't have a spare in the scooter. They were on their way to Colaba to do some shopping, while the adults, that is, us, were enjoying ourselves at a group get-together just ahead of their destination, at Colaba. I got a call on my cell, and Inas, my daughter, practically in a panic, asked me to rush to "St. George's Hospital" as Nuriyah (my niece) had had an accident, and was bleeding profusely from her head wound. The call threw all of us sitting at the get-together in panic, and both us, and Nuriyah's mom and Dad rushed to the hospital, where we took over from the kids (my younger daughter Hannah was also there, as she had also been going with the other two girls to Colaba, albeit on a second scooter). I contacted a surgeon I know, Dr. Saleh Dhansura, and after taking his advice, we all went to Saifee, where we got a C. T. scan done within half an hour. It confirmed the temporal fracture, but revealed also, that there was a thin layer of subdural hemorrhage inside Nuriyah's skull. 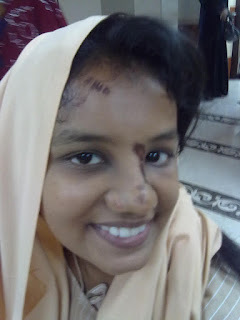 Hence we got her admitted under Dr. Dhansura's care. By the time the C.T. was done, and actually, even before that, Nuriyah was neurologically all right, thus allaying my fear that she would have some deficit or seizure or God knows what else. She was put on IV antibiotics, IV fluids and kept Nil-by-mouth (NBM). A medico-legal case was also registered, and I learnt later that the constable was with Nuriyah's mom late into the night to take her statement. The image below is that of Nuriyah on the day of her discharge. Eventually, Nuriyah stayed in hospital for 3 1/2 days, and we took her home on Wednesday morning after a repeat C.T. scan showed that the bleed inside her skull had resolved completely. 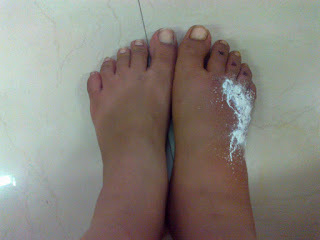 Inas, my daughter, sustained abrasions on the top of her right foot (see above), and these haven't healed yet as I write this. She has started work at the Hotel Leela near the international airport, and is away from morning to late evening. When she returns, her foot has swollen considerably. I started her on anti-inflammatory tablets and an antibiotic. She should improve soon. Last week, I returned from a 9 day holiday to various parts of Himachal Pradesh with my family. An account of this trip can be found here. HP is a naturalist's paradise, and more so for the simple reason that its distinct climate gives it a completely different set of flora and fauna as compared to what one is used to in the tropics, for example, Mumbai and its surroundings, from where I hail. I had carried with me my Canon DSLR, and went near-mad shooting birds, animals and flora of all kinds. However, this post is not just about photography or an egoistic display of my photos. I wish to declare to the world that HP is a must visit state for all nature-lovers. Even if they are on a budget holiday and have to stay in imperfect conditions, one should keep this state on one's wish list if one wishes to see God's Mother Nature in its full beauty. What did I see? I saw the magnificent plain at Khajjiar, a place that has been equated with the best in the world (Khajjiar means "meadow" in Gaddi language, and this place is called the Mini-Switzerland of India). The place has been unduly commercialised, I think, what with horse-riding, zorbing, para-gliding and the inevitable children's play equipment (the inflatable chutes and what not). In spite of this, we had a glimpse of what the plains must have been like before the commercialisation happened. We saw several sheep and cattle grazing on the small blades of grass with an air of complete indifference. Next, the walk up a string of hills to reach a Shiv temple at Dainkund, popularly known as the Valley of Flowers of HP (there is another, more famous Valley of Flowers in Uttaranchal). This walk, which was completely unexpected insofar as we weren't aware it would be a very loooong one, revealed Nature in all its Glory. The weather was cool, and as we walked on and on, climbing one hill after another, we saw vistas of Nature that thrilled us no end. The landscaped were amazing, with the snow-capped hills in the distant background, and the hills and dales undulating up and down right up to where we stood. Occasionally, we stopped to admire the distant views, but more frequently, we paused to see an unusually coloured moth or butterfly; to see grazing cattle or sheep with unusual skin/wool patterns; to see a flitting dragonfly or a smartly flying Red Kite; to watch a floral inflorescence that we had never seen before, or admire a tree that looked unique; to breathe in the breeze arising up from the valley below; to feel upon us, the drops of rain that seemed to materialise suddenly from a cloud that had just made its appearance above us; to soak in the rays of the sun as it continued its inexorable march across the heavens; to realise that the sand underneath us was indeed close in rewsemblance to the sand on a beach, thereby proving that the Himalayas arose from the sea in ancient times; to see an expanse of white, small flowers that grew all around us, and gave the place its name ... and many more things besides. I must mention here that all along the highways that we travelled, the land patterns, the greenery and the obvious intrusion of Nature into Human settlements kept us pre-occupied and happy. However, there is one thing that I must make a special mention of. Water. While the Ravi river stayed alongside most of the roads we travelled while in the Chamba valley, the Kullu valley saw us being a constant companion of the Beas. Both rivers made road travelling a pleasure. It was, for the most part, possible to stop the car, get down, walk a little to the bank of the river, and soak our feet in at any place of our choice, except when we were in the ghats.There were places where the rivers were torrential, and places where they were calm, but they were always interesting and always soothing for the body and the mind. Finally, I must mention that it was in HP that I saw several unique birds ... I have put up the pictures of these here. Do check them out. My family of 4 made a trip to the enchanted state of Himachal Pradesh this month. Actually, I had booked a package on the net with Mr. Rajat Mahajan of Hotel Monal, Dalhousie, and had also sent him an advance to confirm my booking. In the event, the package was definitely substandard, and I would not advise any one to book this package that is advertised on the home page of his hotel's website (http://www.hotelmonal.com) under the button "Packages". Although the stated tour was attractive, the properties where he booked our stay were not up to the mark, except at a few locations. Our itinerary was as under. May 31: We depart by Golden Temple Mail from Mumbai-Central. June 01: In the train through the day and most of the night. June 02: Reach Jallandhar at dawn, and picked up by the package-arranged car to be transported to Dalhousie (120 km, 4-5hrs). Spend the day looking around the place. Stay at Hotel Monal in a family suite. June 03: Sightseeing of Sathdhara, Pajpulla (water-fall), Dainkund (valley of flowers), Kalatop (wild-life sanctuary). Evening free for leisure activities. June 04: Sightseeing of Khajjiar (Mini-Swiss of India), Chamba (historical city), Ravi river bed point, Dam-view and rock-garden. June 05: Departure for Dharamshala (140 km, 4-5hrs). Check-in at Grand Hills Hotel & relax. Visit to the Dalai Lama Temple. Sightseeing of Bhagsu, Naddi, Dal lake, Tibetian Handicraft Center. Evening free for shopping at the local market. June 06: Departure for Palampur (50 km, 1-2hrs) enroute visit to Chamunda Devi Temple. Check-in at Camp-Dhauladhar, Stay ay Luxury Tents. Evening Bon-fire will be arranged. June 07: Departure for Manali (270 km, 7-8hrs) visit enrouting Baijnath Temple, Kullu Market. On arrival at Manali, check-in at Hotel Kalinga International & rest. June 08: Full day excursion to Rohtang Pass (13,500 ft asl, snow point) (50 km from Manali, 2hrs). Visit Solan Valley, Rahla Fall. June 09: Visit to Hadimba Temple, Club house, Vasisth Bath. Eveing free to shopping in Manali. June 10: Drop at Chandigarh (310 km, 8 hrs) for onwards journey. We return by an afternoon flight from Chandigarh to Mumbai via New Delhi. A late realisation that we would be unable to travel for 8 hours and yet reach Chandigarh airport by 2:00 p.m. on the last day made us reduce a day at Manali and we left for Chandigarh on the 9th of June, and spent the night at my wife Nishrin (a.k.a. Guddi)'s cousin Pinky Sohi's place. More on this trip later. Hope you enjoyed reading this first post.